The antibody recognises three different splice forms of Acinus, designated Acinus L, Acinus S and Acinus S'. 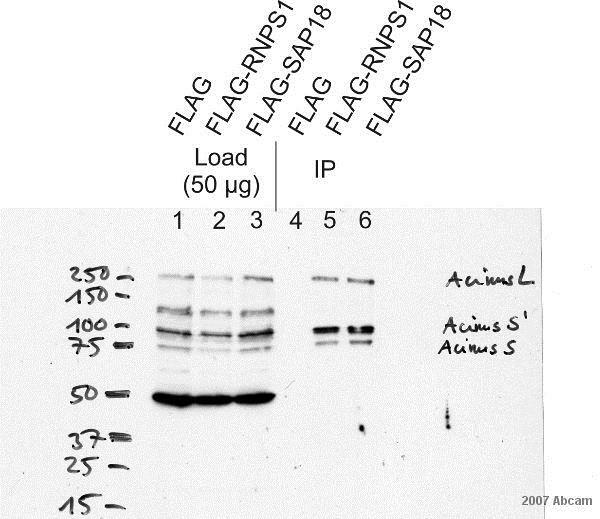 The epitope is a region near the C-terminus of the cleaved active peptide p17. , corresponding to amino acids 1065-1080 of Human Acinus or 307 to 322 of human AcinusS, which are identical to those of mouse Acinus (2). The selected antigenic sequence is locatednear the C-terminus of the cleaved active peptide p17. Purified IgG was prepared from whole serum by affinity chromatography. Our Abpromise guarantee covers the use of ab7352 in the following tested applications. WB Use at an assay dependent concentration. Detects a band of approximately 220 kDa (predicted molecular weight: 151 kDa).Can be blocked with Acinus peptide (ab8367). Component of a splicing-dependent multiprotein exon junction complex (EJC) deposited at splice junction on mRNAs. The EJC is a dynamic structure consisting of a few core proteins and several more peripheral nuclear and cytoplasmic associated factors that join the complex only transiently either during EJC assembly or during subsequent mRNA metabolism. Induces apoptotic chromatin condensation after activation by CASP3. Undergoes proteolytic cleavage; the processed form is active, contrary to the uncleaved form. 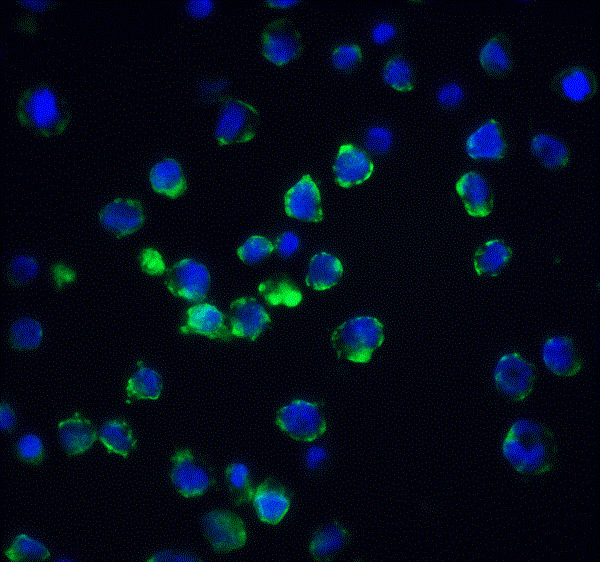 Immunofluorescence of Acinus in Hela cells using ab7352 at 10 ug/ml. ab7352 has not yet been referenced specifically in any publications. Publishing research using ab7352? Please let us know so that we can cite the reference in this datasheet.